Faced with a nearly impossible feat, they search for the third pillar of their powers - the pillar that holds the answer to Nevaeh's salvation. With time running out, can they build the powerful Trinity to save humanity from total extinction? This series is a lot of fun to read and I highly recommend it to anyone looking for a good book to read. Once again a great story. The saga continues great characters great storyline great future possibility. Well worth the read I want more. Audible needs to change the classification of this installment. It needs to be put back into the category of Sci-Fi &Fantasy. They have it listed as Teens 11-13. There are some things that I don't think are appropriate for an 11 year old. If you love epic fantasy stories that take place in a apocalyptic futuristic earth filled with intrigue, suspense, magic, action, deception, unusual creatures and more this series is well worth your time. Well written, entertaining and enjoyable. Great conclusion that does not leave you hanging, but at the same time leaves an opening for future installments in the world of Nevaeh. This is not a stand alone book. There are so many characters and so much going on you need to start at the beginning of the series to understand everything. It is definitely worth starting at the beginning. All the creative detail and imagination that made the first two books in the series great stories are also present in this book. While there is still plenty of action, adventure and magic in this book, it also has a much greater focus on the their psychic powers. The battle we have been building towards is here. Areenna and Mikaal have gathered together all the dominions to fight in the final battle against the Dark Masters. In the fight between good vs. evil and to save the people/world of Nevaeh this is their last stand. Helen McCardle once again does the narration, and she does a great job. Pleasant voice. Clearly spoken. The narration flows smoothly. While there is not much difference between her male and female voices, the character voices are fantastic and easily recognizable. Overall very enjoyable. 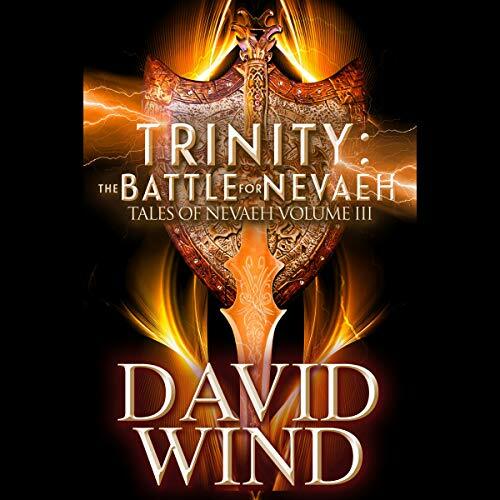 What did you love best about Trinity: The Battle for Navaeh? Areenna and Mikaal. I love how they compliment each other. I like good vs evil fantasy novels like this that don't take themselves too seriously. I thought the narrator did an excellent job. I received this audiobook for free through Audiobook Boom for my unbiased review. yet another battle heavy, doubt plagued, exasperating, yarn deperately in need of an editor. too many holes left open ostensibly to leave an opening for additional books according to the author's note. lame. feels like he just got tired of this one and said done. ugh. just left me angry and puzzled. all three novels. so repetitive. over and over and over. if I'd been reading this instead of audible listening, I'd have skipped huge swathes of it and missed nothing. lots of useless filler that explained nothing and just left tons of questions. what just happened? a question I asked often during these novels. I love these books, the author, and the narrator. I could listen over and over again!!! !